We hope everyone had a great Christmas and New Year's Celebration. Santa brought me toys and bones! I haven't quite figured out how to open my presents, though. My big doggie sister, Chardonay helped me open my presents. I slept through New Year's Celebration. It's just too hard for a little pup like me to stay awake that late. It was waaaay past my bedtime. My tail is just a waggin'! 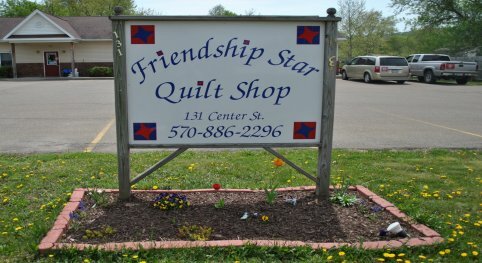 We have lots of great things happening in the Shop this month. 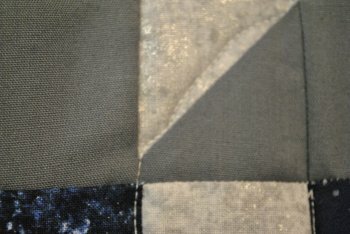 All of our Christmas fabric is 40% Off until Saturday, January 16th. Our newsletter folks are getting it on sale a week before it's advertised. 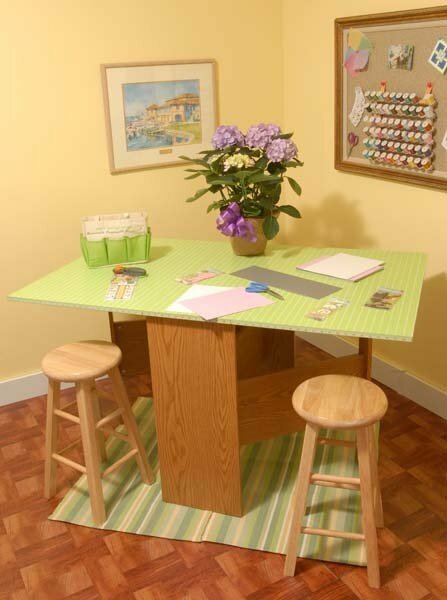 Saturday,January 9th is our Free Pattern and Demo Day. 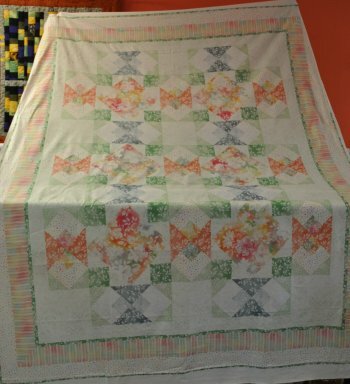 Finished size: 58" x 76"
Get 10% Off these fabrics when you sign up for the class! They are so bright and cheery, perfect for working on during these dreary days. We have class schedules up to April available at the Shop. 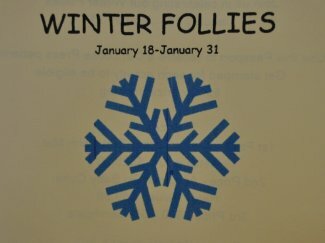 January 18-30 is our first annual Winter Follies. Winter Follies is our Passport Event. The Passport is $3. You will also receive a free pattern and another goodie when you buy your Passport. 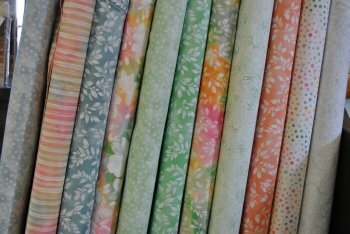 During January 18-3o, come in to watch 2 Demos, purchase 1 yard of regular priced fabric, 1 Notion, 1 spool of thread, and 1 pattern. Fill out the information on the back of your Passport. Everyone that gets their Passport completed and handed in by January 30th will be entered into a Drawing. You must get your Passport stamped for every product and event listed on the Passport to be entered into the Drawing during January 18-30 only. Drawing for our Winners will be held on February 5, 2015. 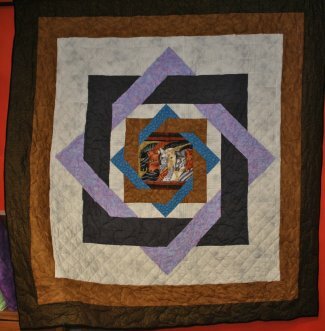 A reminder that the Sewing Machine Doctor will be here on January 14th and 28th. He requires a check made out to him (Jack Sutliffe) in the amount of $53.00. He is normally here from around 10:30-12Noon. Unless he calls you, your machine will be ready the same day. 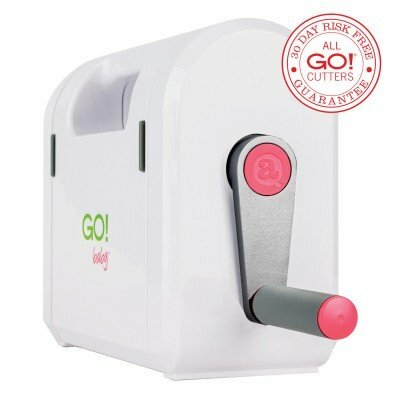 We highly recommend you mark both your sewing machine and foot pedal with a return address label with your telephone number on them as well. Just in case they get separated. Jack will need your foot pedal in order to service your machine. We ask that you not bring machines in before the week that he will be here and that you pick up your machines within 5 days of it being repaired. We have some nice Show and Tell photos for you this month. 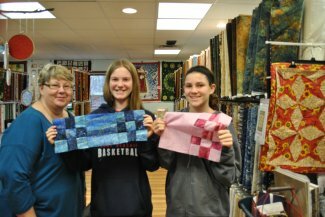 These 2 new quilters took a lesson from Grandma just before Christmas. They both got a good start on their projects. 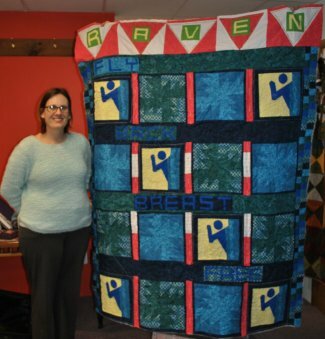 This is Kierstin G. This is her first quilt and she paper pieced it! This is called Brothers and Sisters. We have the pattern book on order. 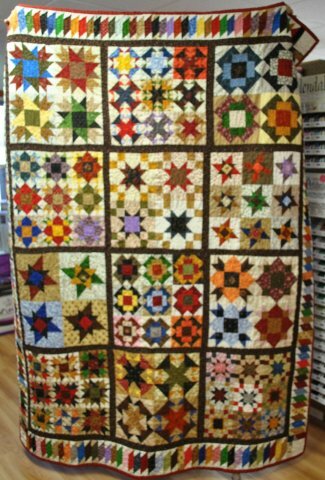 It was created by Maureen P.
is donating it anonymously to the Bradford County 4H to be raffled off to help them raise money. It is currently on display here at the Shop if you want a closer look at it. That's everything that is happening around the Shop in January! Obi, Maryanne and Mary Lou.